Home » Blog » On The Road Again » Belleview Middle School. Ocala, Florida. Read to Death Award. A foggy morning in Ocala, which I’m certain will burn off quickly. I’m at Bellview Middle School today with the very fun Leola LeHew (I love her name) who picked me up at the hotel bright and early and whisk me to the school for a staff breakfast and book signing. I was presented with the “Read To Death” award, which is going up on the wall of my office back at the farm. I’m honored! I spoke to 1,100 fabulous 6th, 7th, and 8th graders in two sessions. You cannot believe all the things they did at the school to prepare for the visit. 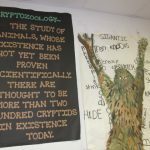 They read “Sasquatch” as a One School One Read book and Bigfoot was seen all over the school. They had a door decorating contest, which I had to judge. A very difficult task. All the doors were wonderful, but Leola made me pick one for each grade level and an overall champion. 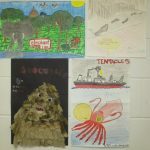 They had a poster contest. Quite a day at a great school. Thank you for inviting me! It was nice to see you today. I was one that had the questions for you on the side at the 1st assembly. I was stunned at all of the information I learned today just from your assembly. Thanks for visiting my school! It was nice to see you today. I was one of the one few selected to ask a question at the 1st assembly (last person). I am glad that you visited my school and look foward to read the books to be out in the future! 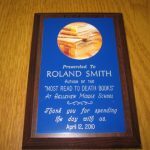 Thank you for sharing your life and your books with our school, Belleview Middle, on Monday, April 12, 2010. My students are voracious readers and your books are always in high demand in our media center. Please continue to write with the zest that keeps our students’ young minds engaged! Thank you so much for joining us at Belleview Middle School! Thanks Mary! I really had a great time. Thank you for joining us! I know that the students really enjoyed your presentation. It was awesome to hear you speak and give insight into what inspires you to write. Thanks for the autographed copy of Sasquatch! Thanks for coming to our school I really enjoyed you. I was so happy when our school anounced that we were going to read your book and so excited when they anounced that you were coming. Thank you for visting us and I will continue reading your wonderful books. dear mr.smith Ireally enjoyed your presentation at BMS I also would like to say I have the firt I.Q book Indepence hall and I love it but I have a question to ask you about it. How did you manage to come up with Quest and the plot for it as well? Enjoyed your visit! I appreciate your letting the students know that they too can be writers! As their writing teacher that is my message to them as well. A huge fan of both Eric Clapton and Jimi Hendrix, I was quite excited when you shared that you had the chance to meet them both. Actually, jealous might be the better word. I look forward to reading more of your work. I think I will read Zach’s Lie next. Take care! ← On my way to Ocala, Florida. Memoir?